In Lab 3 you started a quantitative assessment of the prevalence of microbial digesters of cellulose, starch, and for solubilizers of phosphates. Think about why we chose to test for your soil community's ability to process these particular nutrients. Why would it be advantageous for a soil microbial community to include members that secrete enzymes that process starch, cellulose or phosphorus into other forms of nutrients? Would it be advantageous for all of the community members to possess all of these abilities? Why or why not? What might be the cost? Would the microbial community be different if NONE of its members secreted these exoenzymes? If microbial community membership is always in flux, trying to maintain a balance where its members can all survive and thrive, do you think the prevalence of these exoenzyme producers is constant or variable? If variable, what are the conditions that might have an effect on prevalence? Today you will complete the colony counts from the differential media that you inoculated with dilute soil extract last week. You and your group members will perform calculations that assess the prevalence of community members able to perform these valuable functions. Your data should provide evidence of co-operative behavior among members of this soil community. Examine the plates for evidence of digestion or processing of a particular nutrient (starch, cellulose or insoluble phosphates) in each of the differential culture medium. Remember that these differential media are not selective (they aren't designed to inhibit the growth of any groups of soil microorganisms), but they are differential media, in that they allow you to visibly SEE the difference in particular groups of microbes---in our case, between those that produce and secrete a functional exoenzyme and those that don't. You will count the number of individual colonies showing a clear zone (halo) around the colony (using the plate with 30-300 total colonies) and compare those numbers with the number at the same soil dilution that grew on NA- a general purpose, non-differential medium. Why does a halo indicate digestion of starch, cellulose, or processing of insoluble phosphate into a soluble form? 1. Count the total number of colonies on the Nutrient Agar plate and assess total culturable CFU. Use the soil extract dilution of the plates counted to calculate CFU/gram of soil (wet weight) for each assessment medium. If you divide the number of colonies counted by the amount of inoculum plated times the dilution factor of that plate, you will obtain the number of cultivatable bacteria per gram of soil. 2. Flood the starch plate with a thin layer of Grams iodine and count the number of colonies that show starch digestion activity as a clear zone or non-blue halo around the colony). 3. Count the number of colonies that show cellulose digestion activity as a clear zone or halo around the colony. 4. Count the number of colonies that show phosphate solubilizing activity as a clear zone or halo. 5. Calculate the prevalence (in %) of exoezyme secreting microbes out of the total in the culturable community for each assay (# positive colonies x dilution factor/total colony count x dilution factor on nutrient agar) X 100. This correction for dilution factor allows you to compare the CFUs counted from different dilutions on plates. (If you are able to use control (NA) and test plates from the same dilution (each has between 30-300 colonies), you can omit the dilution factor.) Be sure to show all your data and calculations in your notebook and enter your data in the lab Google Doc. 6. Perform an ANOVA to see if the organisms with these exoenzymes are distributed evenly in the population. You have been asked to calculate Community Metabolic Diversity (CMD). CMD is a simple way to represent the total number of substrates able to be effectively metabolized by the microbial community. It's a measurement of diversity in use of carbon sources. Clearly a quantitative evaluation of CMD is more meaningful in relationship to other soil communities or when compared to some standard or reference point. If you are only analyzing your own soil community and have no other communities to compare, the reference comparison that you should use to make this quantitative evidence meaningful is to calculate a percentage of substrates used by the community (CMD) out of the total number possible (the number of substrates on the plate). Your group should have a week of daily measurements recorded on the Excel workbook we provided as a template. This template is pre-formatted for the first set of calculations you will do from these data. It includes the formulas to average replicate measurements each day and it will automatically subtract the background (readings in the water wells). There is a normalization for background that will be subtracted automatically (this threshold absorbance is provided by the manufacturer and was determined to be 0.25 absorbance units for each carbon source). These calculations are the first step in figuring out what you can learn from these data that provides evidence for one or more of our investigative goals. CMD is calculated by summing the number of positive responses (wells with a positive A595nm value after all the corrections) at each reading day. On your worksheet enter for each carbon source either a 0 or a 1. One indicates a positive value for absorbance at A590nm after correction for background. (Remember that this correction is built into the formulas embedded in the template spreadsheet.) Zero should be entered for carbon sources that have either a negative value or a zero (0.0) absorbance after the built-in correction. Zero means that the community was unable to use that particular carbon source for its metabolic needs. Once you have entered a 1 or a 0 for each substrate, the template will sum the positive values. This number is your CMD for that day. It indicates the number of substrates usable by the community. Enter your daily CMD values into indicated column on the final page (CMD graph) of your worksheet template. A graph should be automatically generated showing average CMD on the y axis versus time (day) post-inoculation. Use the peak CMD value to calculate % of carbon sources utilized [number utilized divided by the total number available(31) x 100]. In lab today brain storm with your partners about how you will use these results in a figure/table and in the results narrative to help the hypothetic reader of your research report on this investigation to understand what your data mean in terms of our experimental questions. You will analyze these data and think of creative ways to make effective tables/figures with appropriate legends. More information about how to analyze these data and on how to use your data as evidence for conclusions to our experimental questions can be found in the description of the Assignment for this week at BISC209/S13: Assignment_209_BIOLOG. Your goal is for each student to end up with ~4 pure cultures of genera of bacteria that are different from each other and different from those of your teamates. If you have only 3 isolates today or is some are not pure, you might add an exoenzyme producer. You will need to isolation streak 2-3 times prior to next lab to have the new organism in pure culture in time to be sent out for sequencing. Once you believe you have pure isolates, continue to subculture to fresh NA plates each week (isolation streak a colony onto a fresh plate), in subsequent labs you will make a bacterial smear and do a Gram stain and start other tests to explore the physical and metabolic characteristics of this isolate. Generally the medium used is the isolation medium, however for this project we will use nutrient agar after the initial isolation. Ask you instructor if you are not sure what to do. Today you will make smear slides (explained here and in Protocols as Smear Slide Preparation) and perform a simple stain (found here and in protocols as Stains: Simple Stain). You will visually inspect your isolates to see if they are bacteria, not yeast, and to see if they appear to be pure based solely on morphology. The first of the dyes most useful to bacteriologists was a reddish violet dye, mauvein, synthesized in England by William. H. Perkin, and patented by him in 1856. This synthetic dye and others were immediately appreciated by histologists, but were not applied to bacterial cells until Carl Weigert (a cousin of Paul Ehrlich) used methyl violet to stain cocci in preparations of diseased tissue in 1875. Subsequently, the use of various synthetic dyes for bacteriological preparations developed rapidly when they were promoted through the publications of Robert Koch and Paul Ehrlich. The synthetic dyes are classified as acid dyes, or basic dyes, depending on whether the molecule is a cation or an anion. The introduction of the terms acidic and basic was unfortunate because it would be more revealing to refer to them as cationic or anionic dyes. A look at the structural formula reveals the nature of the dye. Each dye molecule has at least two functional chemical groupings. The auxochrome ionizes and gives the molecule the ability to react with the substrate, while the unsaturated chromophore absorbs specific wavelengths of light. The color of the solution obtained is that of the unabsorbed (transmitted) light. 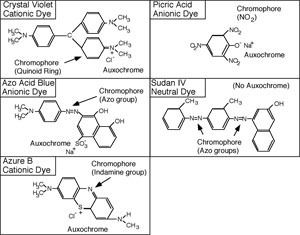 To be a dye, the molecule must have both auxochrome and chromophore groups. The auxochrome is usually an ionized carboxyl, hydroxyl, or pentavalent nitrogen group. The chromophore may have unsaturated nitrogen bonds such as azo (-N=N-) indamine (-N=), nitroso (-N=O) or nitro (O-N=O), groups; or unsaturated carbon to carbon, carbon to oxygen, or carbon to sulfur bonds, such as ethenyl (C=C), carbonyl (C=O), C=S, or the quinoid ring (= = =). Resonance is also important to color. In crystal violet, an electron resonates between the three benzene rings. As the pH of the solution is lowered, the resonance becomes more and more restricted. When the resonance is restricted from three to only two benzene rings, the solution turns from violet to green, and then to red when resonance between the two rings ceases. Cationic dyes will react with substrate groups that ionize to produce a negative charge, such as carboxyl, phenolic, or sulfhydryl groups. Anionic dyes will react with substrate groups which ionize to produce positive charges, such as the ammonium ion. Any substrate with such ionized groups should have an ability to combine with cationic or anionic dyes. Generally, the most important staining substrates in bacterial cells are proteins, especially the cytoplasmic proteins; however, other substances also have dye affinity. These include amino sugars, organic acids, nucleic acids, and certain polysaccharides. Sudan III, or sudan black B, is a popular stain for fatty material. It does not have an auxochrome group, and is insoluble in water, but soluble in fatty material. When a solution of sudan black B in ethylene glycol is placed over bacterial cells, the fatty material will dissolve some of the dye and thus take on the color of the sudan black. The staining effect is purely a solubility phenomenon, and not a chemical reaction, or physical adsorption. There are many stains that can reveal the morphology of the cell, and some simple stains, such as methylene blue, are quite good for viewing bacteria. The Gram stain is especially useful because it not only reveals bacterial morphology, but also is a differential stain. A differential stain differentiates organisms. (A differential stain shows a visible difference between different groups of organisms based on some characteristic they do not share, even though the procedure to stain the different looking organisms is the same). The Gram stain relies on cell wall differences between groups of bacteria. 1. Use a graphite pencil to label on the far left side of a clean, glass slide the code ID of three of your isolates. Make enough slides, with no more than 3 organisms/slide so that all your isolates are included and there is one space for a "control" organism EC (Escherichia coli). 2. Prepare the slide with the "control" first by using your (unsterile is OK) loop to apply three tiny drops of deionized water to different parts of this pre-labeled slide. Flame sterilize the loop, allow it to cool for a few seconds and touch the cooled loop to a single colony of the control culture plate of E. coli. Pick up a VERY TINY bit of growth from a single bacterial colony. 3. Place the loop with the bacterial growth into the drop of water. Use a circular motion with the loop to make a smooth suspension of the bacteria in the water. Stop when you have spread out the circle of emulsified bacteria as much as possible to cover a space about the size of a quarter, while making sure to leave room to make two other smears on the slide. 4. Now you are ready to apply your isolates. Using your best aseptic technique, flame sterilize your loop. Apply a very small loopful of deionized water (bottle on your bench) to the slide and then add a tiny amount of bacteria from a fresh culture growing on solid medium of one your isolates. Create the smear as you did for the E. coli. Move from left to right spacing the smears so that isolates fit on the slides. (NOTE: Broths can also be used to make a smear. In this case, be sure to mix the broth, carefully vortex or tap the bottom of the tube. Remove the culture tube top (NOT placing it on the bench) and pass the lip of the culture tube rapidly through the flame. Dip your loop into the broth culture and place a small drop of broth culture of that isolate on the appropriate place on the labeled slide. (The labeling from top to bottom should refer to isolates placed left to right.) Mix the drop with your loop to disperse the broth over an area that will not touch the next culture but is large enough to allow your slide to dry quickly. 7. Make notes about how easy or hard it was to pick up a bit of a colony, how cloudy the drop looked after inoculation, and if you could still see a "cloudy" area on your slide after you stain your organism. To simple stain the previously prepared heat fixed, bacterial smear slides, perform the staining protocol from start to finish on one slide at a time. You must be careful to apply the staining reagents liberally so all the smears are evenly and completely covered and you must be sure to expose each smear to each reagent for the same amount of time. 2. Dispense just enough Safranin solution to cover all the smears on your slide and let it sit for 1 minute. 4. Blot dry using the bibulous paper package found in your orange drawer. Do not tear out the pages, just insert your slide and pat it dry. 5. Clean up your area; rinse your staining tray in the sink and leave it to drain upside down on paper towels. Analyze the prevalence of microbial starch & cellulose digesters and phosphate solubilizers in your soil community. Analyze your soil sample's community data for carbon source utilization; turn in spreadsheet with calculations and make graphs turned into figures/tables with legends. Consult the full directions for this assignment found at: BISC209/S13: Assignment 209 BIOLOG. Continue monitoring and following the appropriate protocols to isolate our targeted bacteria to pure culture. If you need to subculture several times this week to achieve a pure culture, do so! You must have pure cultures next week. Please make a fresh plate of each of your isolates (MUST BE PURE CULTURE!) before your lab by adding a single well-isolated colony from a plate with only one type of bacteria growing on it and incubate your broths at RT. Please be sure to subculture fast growing cultures no more than 24 hours prior to lab 5 and slower growing cultures, ~48 hours before lab so that we will have young cultures to work with. Use your judgement or ask your instructor for advice on how far in advance to subculture extremely slow growing isolates of groups such as Actinomycetes. Next week we will start our tests that characterize our isolates and we will also perform 16S rRNA gene amplification by PCR. If our amplifications are successful, we will send cleaned-up pcr products to a DNA sequencing facility for sequencing of the 16S rRNA gene of each of your isolates. When the sequences come back we will use a public database to compare these DNA sequences to others submitted to this bacterial database and, we hope, to identify a few members of the bacteria in your soil community.